Virginia Distillery Company recently launched the Cask Society through a partnership with Schneider’s of Capitol Hill in Washington, D.C. This unique program allows a person or group to purchase a cask of whisky from Virginia Distillery Company. Cask Society membership starts at $9,900, with personalized options available for each member. The Cask Society allows the member to choose their own version of Virginia Single Malt by selecting from a variety of options, such as barrel types, aging lengths and even bottling strength. Cask types include ex-Bourbon, treated wine casks and even large Sherry casks. Members may also choose the aging length, from a minimum of four years to ten-plus years, and cask strength as well as standard bottling strength of 46% alcohol by volume are available. Pricing for the program starts at $9,990 and will vary based on the options selected. Once a member elects to join the Cask Society, the member is invited on-site to fill their own barrel, or they may elect to have the distilling team hand-select a cask based on the customer’s barrel profile. The cask is personalized with the member’s name and placed in Virginia Distillery Company’s Cask House No. 1 for aging. Once the whisky is ready, a chance to participate in the bottling is included with the Cask Society membership. 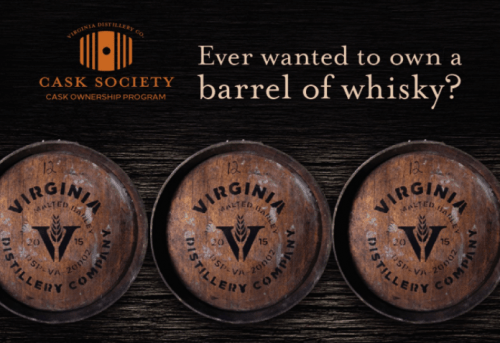 Cask Society membership includes access to exclusive perks at Virginia Distillery Company while the whisky continues to age. Perks include first access to limited whisky releases, complimentary tour and tasting credits, invites to VIP tastings and specialty gifts such as a custom copper barrel thief and a bottling party. Members will receive an engraved plaque, along with a matching copy to be displayed in Virginia Distillery Company’s Cask House No. 1. At the completion of the program, members can elect to keep the cask or opt for the barrel head. Membership restrictions apply for residents of certain states. For more information, visit the distillery’s website at www.vadistillery.com/casksociety. Virginia Distillery Company whiskies yield a complex taste, due to the influence of Virginia’s Blue Ridge Mountains and maturation in ex-bourbon, Sherry and treated wine casks. The distillery is currently crafting its Virginia Single Malt at the distillery located in Lovingston, Virginia. The casks have been resting since November 2015 and will be bottled when the whisky says it’s ready. While the Virginia Single Malt ages, customers may enjoy Virginia Highland Malt.